A schwarzite created on a 3D printer by materials scientists at Rice University. The curved surface repeats throughout the structure, which showed excellent strength and deformation characteristics in tests at Rice. Photo: Jeff Fitlow/Rice University. Engineers at Rice University are using 3D printers to turn structures that have until now existed primarily in theory into strong, light and durable materials with complex, repeating patterns. The porous structures, called schwarzites, are designed with computer algorithms, but the Rice engineers found they could send data from the programs to printers and make macroscale, polymer models for testing. Their samples strive to use as little material as possible and still provide strength and compressibility. As the engineers report in a paper in Advanced Materials, this process produces works of art that may someday lead to nanoscale electronic devices, catalysts, molecular sieves and battery components. At the macroscale, the structures could become high-load-bearing, impact-resistant components for buildings, cars and aircraft. It may someday be possible, the engineers said, to print an entire building as one schwarzite ‘brick’. Schwarzites, named after German scientist Hermann Schwarz, who hypothesized the structures in the 1880s, are mathematical marvels that have inspired a large number of organic and inorganic constructs and materials. The discovery at Rice of the Nobel Prize-winning buckminsterfullerene (or buckyball) provided further inspiration for scientists to explore the design of 3D forms from 2D surfaces. Such structures remained theoretical until 3D printers provided the first practical way to make them. The Rice lab of materials scientist Pulickel Ajayan, in collaboration with researchers at the University of Campinas, São Paulo, in Brazil investigated the bottom-up construction of schwarzites through molecular dynamics simulations and then printed those simulations in the shapes of polymer cubes. "The geometries of these are really complex; everything is curved, the internal surfaces have negative curvature and the morphologies are very interesting," said Rice postdoctoral researcher Chandra Sekhar Tiwary, who led an earlier study that showed how seashells protect soft bodies from extreme pressure by transferring stress throughout their structures. "Schwarzite structures are very much the same," he said. "The theory shows that at the atomic scale, these materials can be very strong. It turns out that making the geometry bigger with polymer gives us a material with a high load-bearing capacity." Schwarzites also displayed excellent deformation characteristics, he said. "The way a material breaks is important," Tiwary said. "You don't want things to break catastrophically; you want them to break slowly. These structures are beautiful because if you apply force to one side, they deform slowly, layer by layer. "You can make a whole building out of this material, and if something falls on it, it's going to collapse slowly, so what's inside will be protected." Because schwarzites can take a variety of forms, the Rice team limited its investigation to primitive and gyroid structures, which have periodic minimal surfaces as originally conceived by Schwarz. In tests, both structures transferred loads across their entire geometry, no matter which side was compressed. That held true in the atom-level simulations as well as for the printed models. "It is a little surprising that some atomic-scale features are preserved in the printed structures," Galvão said. 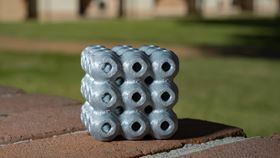 "We discussed that it would be nice if we could translate schwarzite atomic models into 3D printed structures. After some tentatives, it worked quite well. This paper is a good example of an effective theory-experiment collaboration." The researchers said their next step will be to refine the surfaces with higher-resolution printers and further minimize the amount of polymer to make the blocks even lighter. In the far future, they envision printing 3D schwarzites with ceramic and metallic materials on a grander scale. "There's no reason these have to be blocks," said co-author and Rice graduate student Peter Owuor. "We're basically making perfect crystals that start with a single cell that we can replicate in all directions."